That's right. 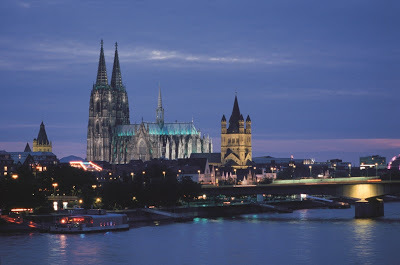 On the morning of January 19th, 2011 I'm boarding a plane bound for Cologne (that's Köln to those of us who are in the know) where I'll be attending the annual internationale möbelmesse. The internationale möbelmesse is better known as the IMM and it's the world's premier showcase of new furniture and products for the home. Last year's IMM had 1500 exhibitors and had 100,000 visitors from all points of the globe. This year's expo promises to be even bigger and for the first time in the 62 years of the show's existence, there will be a separate exhibit for the international kitchen and bath industry and they're calling it The Living Kitchen. The Living Kitchen has its own website and from the looks of things it will surpass the Kitchen and Bath Industry Show in the US in size and scale. Needless to say, I'm beyond excited about this. I'll be blogging and Tweeting from Germany as part of an industry press junket courtesy of Blanco. I cannot thank them enough for this opportunity. Blanco is a German sink and fixture manufacturer and their products are widely available worldwide. I sit on Blanco's Design Council, an honor I've held for the last year. It's through my involvement with Blanco's Design Council that I'm Cologne bound. There are five other Design Council members going on this trip. That all six of us know each other already will make this trip even more memorable that it would have been otherwise. My traveling companions to Cologne are Jamie Goldberg, Cheryl Kees-Clendenon, Susan Serra, Leslie Clagett and Kevin Henry. Five out of the Cologne Six are are part of the Blogger 19 interestingly enough. What year this has been. Whew! In addition to experiencing the sights and sounds of Cologne and the IMM, We'll be touring a Blanco factory and meeting with Blanco Germany's industrial designers. Needless to say, I'm beyond exited. Thank you again and in advance to Blanco and their representation in the US for this honor. We do, it's just like in the Twilight books. I cannot wait 'til January, that's for sure. Awesome and congratulations! Blanco couldn't have found a better person to cover the show! I'm excited and look forward to your posts and tweets about this awesome show! Thanks Bill, I am beyond excited about this. Beyond excited. What fun! Great show, great city! I don't think you'll be able to make it to the top of the cathedral and all the way around the show floor, though, unless you start training now. Or hire a sherpa. Thanks Kim. Nothing is going to keep me out of that Cathedral. The only fascination I have that eclipses my love of all things Roman is my love of all things Gothic. Let me know if you want a dispatch from the floor. Love the lead-in to this...thought maybe you were going to write to us in German. Amazing that technology has helped people create wonderful, meaningful (and global) connections. It gives us an opportunity to reach out, learn something new, explore, and experience life. Kudos to Blanco! I feel your energy and look forward to hearing all about the trip. Thanks! I was just saying the same thing to someone on Facebook the other day. The world is a smaller place in a lot of way and my head spins when I think about the national and international connections I've made in the last few years. In that case, I say pay for the audio tour (always do at museums and cathedrals) and go to the top of the tower. But seriously, my knee was messed up afterward for a few weeks, so do be careful. It gets to be a very narrow spiral at the top. And you know, there is an ancient Roman gate outside the cathedral, so you can combine both loves in one experience. Oh I've done my research. I've known about this trip for a while and I've had enough time to enroll in a conversational German class and have been reading up on Roman Germania. I cannot wait! 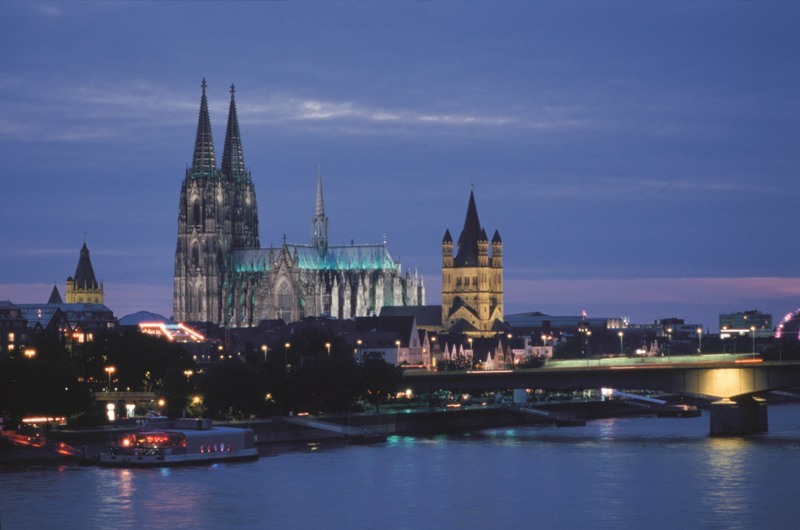 I've been to the top of the dome at St. Peter's in Rome so I need to get to the top of the Cologne Cathedral to complete a circle. It will be frigid I'm sure but that'll be one of those once-in-a-lifetime experiences that no amount of discomfort can dissuade me from doing. I am SO JEALOUS. Damn you. I think you need a valet for the trip.. I promise that I can iron! Paul, I had no idea you were on the blanco "design council." I loves me my blanco silgranit sinks. What a great trip and undoubtedly good company. guten tag! Do you need a photography assistant? How fabulous for you! I can't wait to read about all of the Euro design deliciousness you find. I'll need someone who can iron AND translate. Rachele: I announced it here more than a year ago. You're supposed to hang on my every word. Hah! Raina: I can't wait to see it either. Wait 'til my dispatches from the front start filing in come January. Wow, what a great opportunity! Congrats. Steph and Ade: Thanks. I am over the moon. Nim: I know how to say Scheiße and what it means. So your translation skills may come in handy. This is great news! imm cologne and LivingKitchen with all the new products will be a great place to blog and twitter! Thanks! Will you be there too? Sorry we'll miss each other. Hey, I'll be in Valencia for Cevisama a week or so later, will you be there?